The best luggage for travel is strong enough to make it through baggage handlers and good looking enough to be pulled around international airport terminals. Durability, function, and size are the specifics you should consider before buying. The biggest difference between types of luggage is the material it’s made of. The material can affect the durability, appearance, and cost. Deciding which factors are most important for your style of travel will narrow down the best luggage for travel for you! Tip: Want to pack light, create a travel capsule wardrobe which can easily fit into a carryon suitcase with the help of packing cubes to compress your clothing! Wondering how to choose the best luggage for travel? Start with the number of wheels. Don’t make this choice solely based on how the luggage rolls in the store; consider the environment you’ll be traveling in. For most people, everywhere you go isn’t going to have smooth airport floors! Four wheels glide the easiest through airports and train stations. Being able to push your suitcase (versus pulling it behind you) is a lot easier on your body, especially when your bag is heavy! If you’re really worried about extra weight, it’s worth noting that a four-wheeled suitcase will weigh slightly more than a two-wheeled suitcase. Delsey’s Helium Aero Spinner is a great four-wheel suitcase that will glide easily through any terminal, and is often considered one of the best luggage for travel. Buy it here! Two-wheeled cases are not as easy to pull through airports as four-wheeled ones, but they are significantly easier to navigate on cobblestone roads. If you do a lot of Europe travel, you may want to consider sticking with the traditional two wheels. Tumi Alpha 2 is a durable choice, guaranteed to last through any uneven terrain. Buy it here! Bags without wheels are great for those who travel with significantly smaller suitcases or those looking for weekender bags. If a duffle bag is all you need, getting one without wheels will save on your overall luggage weight. The Briggs & Riley BRX Duffle is a fantastic choice for a travel duffel bag. Buy it here! Alternatively, if you like this style but need wheels, check out these rolling duffle bags that make great alternatives to travel backpacks! I learned a tough lesson when I assumed bigger was better when it came to checked luggage! I thought a 30” suitcase would be perfect for bringing eight pairs of shoes and endless bikinis. But it turns out I wasn’t able to lift my suitcase off the baggage carousel! In addition, even with four wheels, it was really hard for my 5’1” body to push this suitcase around. The best luggage for travel is the one that you can carry comfortably! Tired of overpacking? Read our ultimate guide on carry-on bags only. 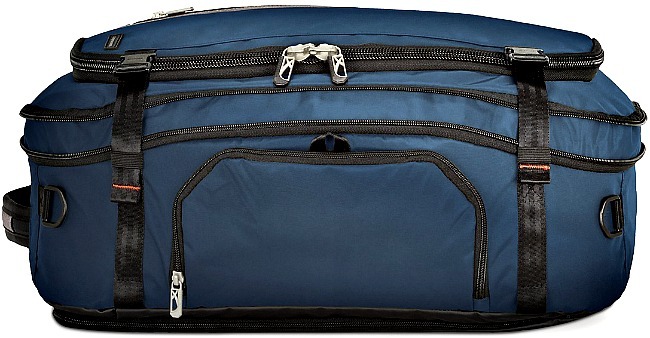 This size is great for travelers who want to jetset with carry-on only. Using smart packing techniques and organizers like those shown in this video tutorial, you can travel carry-on for any destination or trip length. We definitely think this is one of the best luggage for travel. Delsey offers stylish and cost-effective luggage. The Chatelet style is gorgeous! Buy it here! These are the perfect size for people who need to check a bag. The ideal height for someone using this size luggage would be over 5’4”. The suitcase will reach to your mid-thigh, which is the optimal height for easy mobility. Samsonite’s Omni Spinner is the perfect height and size for average-height travelers who don’t want to travel carry-on, and many travelers say this is the best luggage for travel. Buy it here! Larger suitcases are best left for people who are 6’ or taller and specifically need to pack a larger quantity of items. The handle will be at the right spot for you to comfortably pull it around the airport. Many women will find this size to be overwhelming, especially if you’re traveling alone. 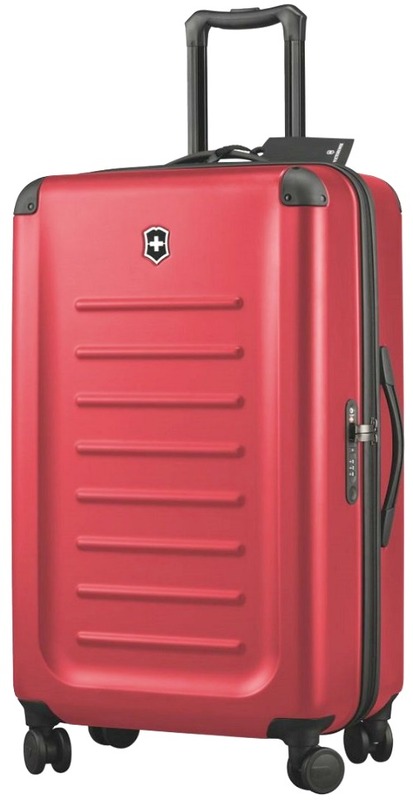 The Victorinox Luggage Spectra 2.0 is a great choice to accommodate travelers with various heights! Buy it here! Another question you’ll be faced when determining how to choose the best luggage for travel is the luggage material. Different materials are more durable than others, some are waterproof, and some are lightweight. You’ll want to evaluate which matters most to you. The hard sides of polycarbonate luggage prevents the suitcase from caving in, which protects your belongings. The major downside to “hard” luggage is that it scratches easily and occasionally cracks. Many travelers consider polycarbonate hard suitcases the best type of luggage because it’s lightweight. Delsey Helium Titanium is a popular choice for polycarbonate luggage. Buy it here! Nylon fabric is both strong and lightweight, making it the most durable option. Nylon also has more “give,” allowing you to squeeze in that extra pair of shoes. Some nylon suitcases are made from the same technology used in military gear, so you know your stuff will be safe! 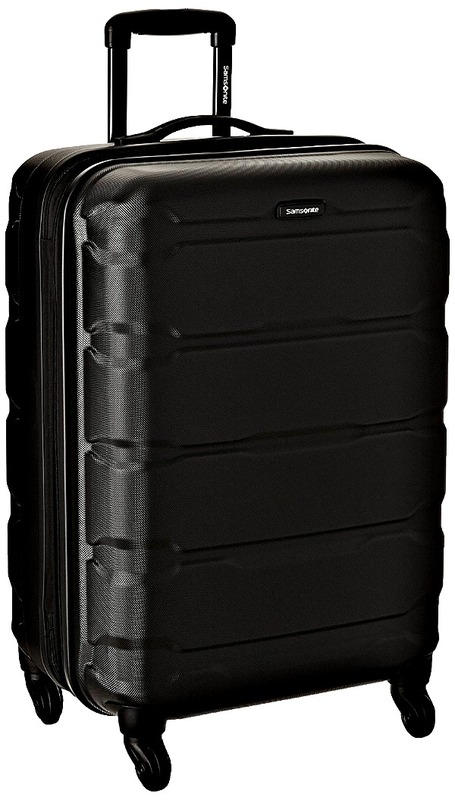 For a high quality and lightweight nylon suitcase, the Samsonite Pro 4 DLX Spinner is what some call the best luggage for travel. Buy it here! Polyester fabric is the cheapest and least durable. You can usually find these suitcases on sale in a local mall, but they won’t last very long. If you’ve ever seen how luggage gets handled at an Italian airport, you won’t be buying a polyester suitcase. Let’s just say, most of the best luggage for travel isn’t made from polyester. 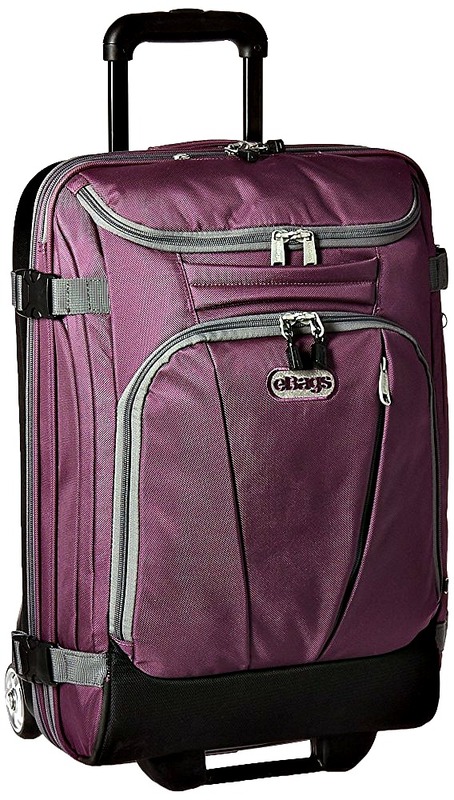 eBags TLS Mother Lode an example of an affordable and popular polyester suitcase. Buy it here! Delsey’s Helium Aero Spinner is a great four-wheel suitcase that will glide easily through any terminal. 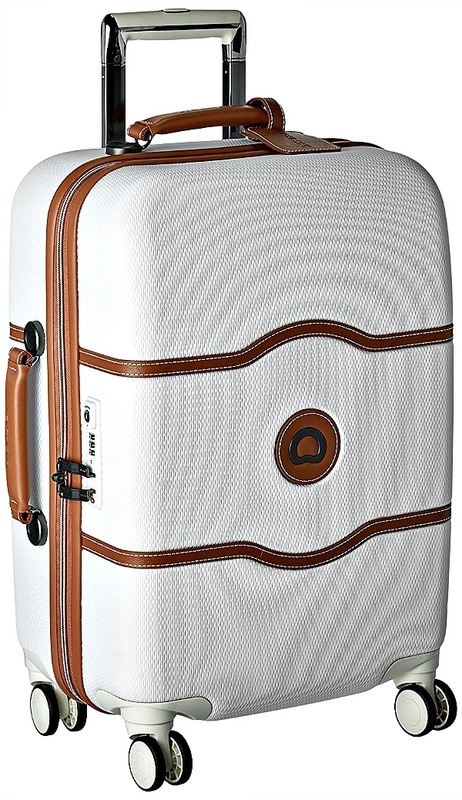 Delsey offers stylish and cost-effective luggage. The Chatelet spinner style is gorgeous! 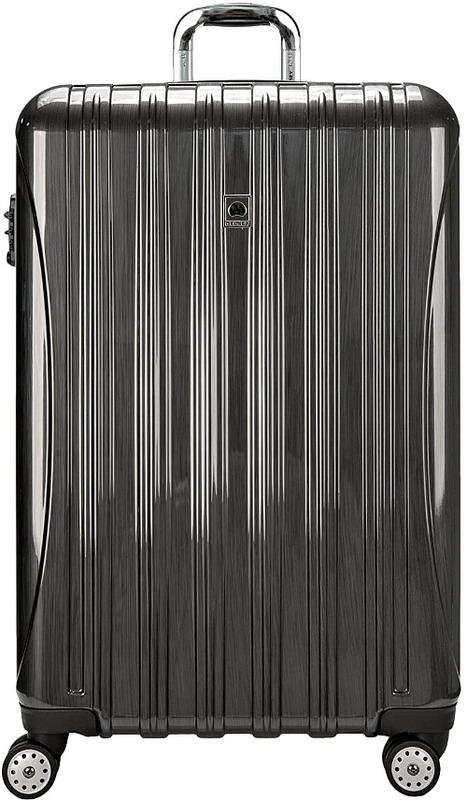 Delsey Helium Titanium is a popular choice for polycarbonate luggage. 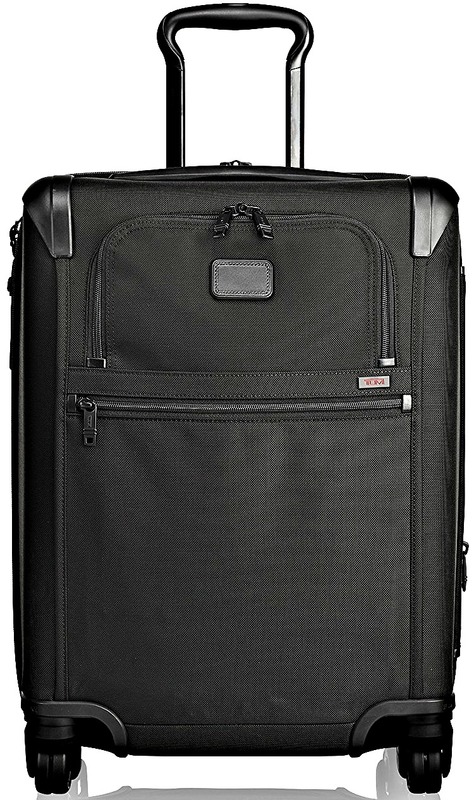 Tumi Alpha 2 Continental is a durable choice, guaranteed to last through any uneven terrain. Samsonite’s Omni is the perfect height and size for average-height travelers. For nylon, the Samsonite Pro is what some call the best luggage for travel . The Briggs & Riley BRX Duffle is a fantastic choice for a travel duffel bag that will save on your overall luggage weight. 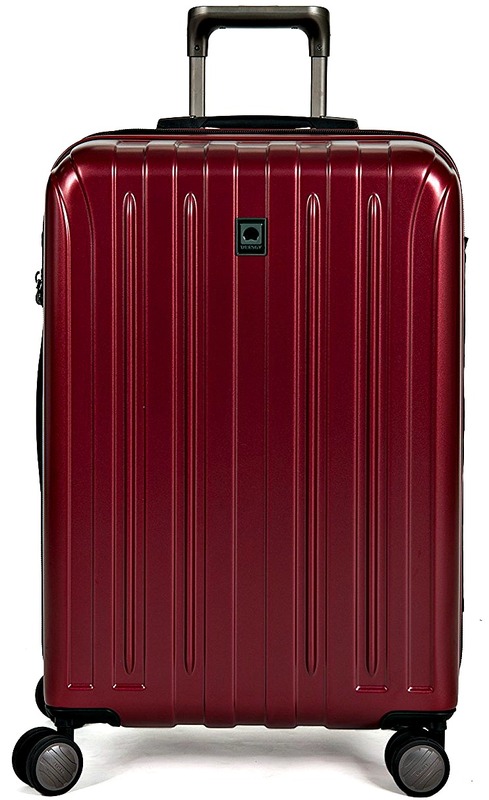 The Victorinox Luggage Spectra 2.0 is a great choice to accommodate travelers with various heights! 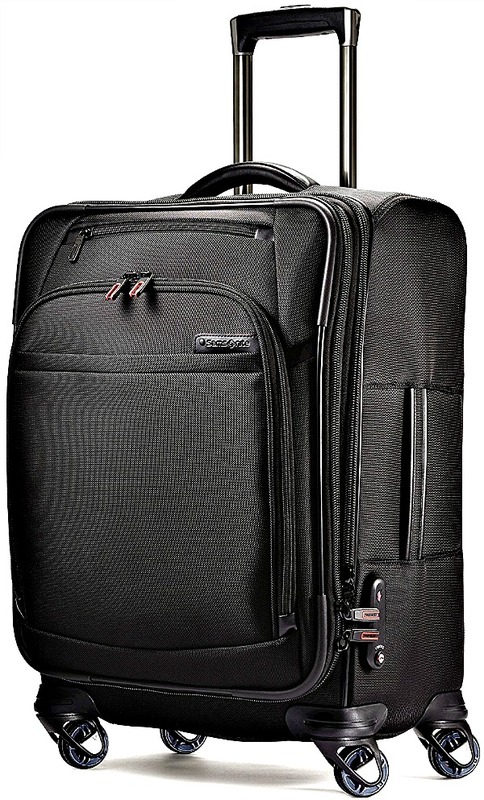 eBags TLS Mother Lode an example of an affordable and popular polyester suitcase. If you’re stuck between two suitcases, compare their warranties. We love companies that offer lifetime warranties! Bring a measuring tape with you when shopping for luggage. I was heartbroken when I discovered that my Heys Smart Luggage was significantly larger than advertised. Airlines have different size restrictions. Jot down the maximum measurements for the airlines you’re most likely to fly with before buying luggage. Be aware that international airlines have tighter size restrictions than US domestic airlines. Always check the wheels, zipper, and handle before buying. I once fell in love with a Samsonite, but when I had trouble using the zipper in the store I knew I couldn’t buy it. Lockable zippers are a bonus to help prevent theft! With so many flashy suitcase colors, it’s hard to buy one that will stand out from others on a baggage carousel. Consider going with classic black and adding a luggage strap. The strap gives you added security, and your black suitcase will look chic whether you’re traveling for business or pleasure. Empty suitcases roll a lot easier than full ones. Stuff a smaller suitcase into your suitcase at the store to get a better idea of how it will perform. 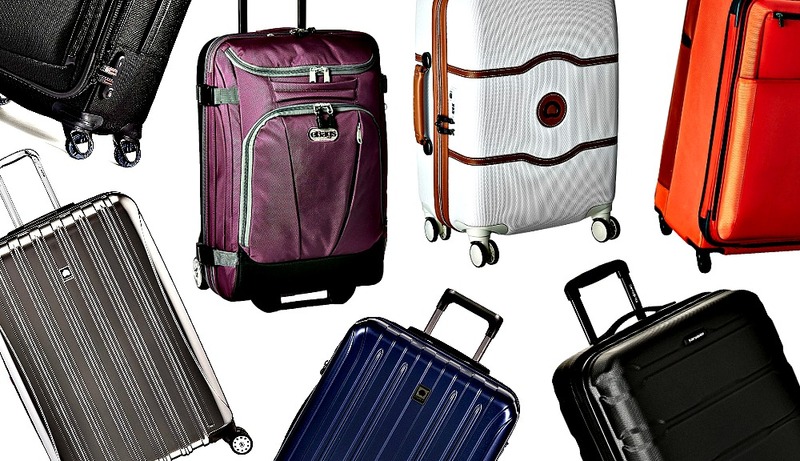 What are your tips on how to choose the best luggage for travel? 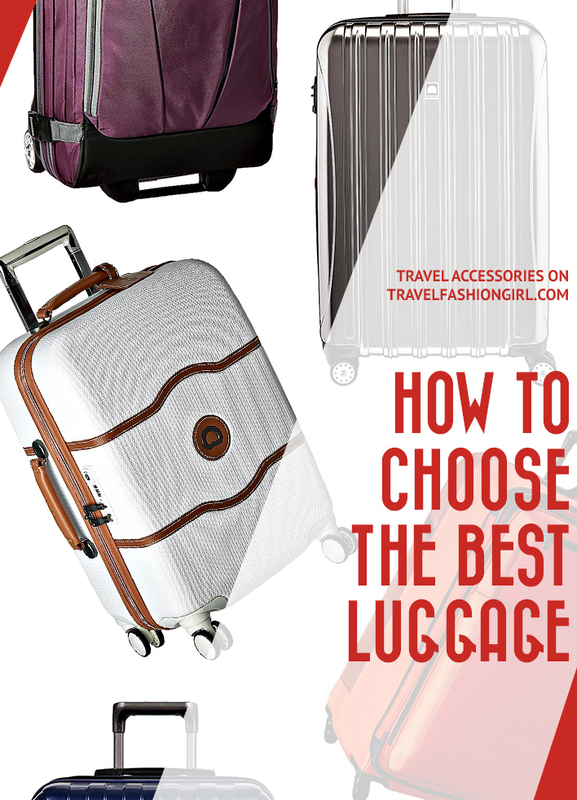 I hope you enjoyed this buying guide on how to choose the best luggage for travel. Please share with your friends on Facebook, Twitter, and Pinterest. Thanks for reading! Author Bio: Kelly Ella Maz is a travel writer from Canada. Her passion for travel and world-wide experience led her to start her own travel planning business and blog. She recently bought a one-way ticket to Barcelona, where she’ll be living by the beach and traveling around Spain. You can follow her travels at www.kellyellamaz.com. Alex— have you reviewed the Away brand of luggage? It looks really good online but would be helpful to have an independent review. It’s a highly recommended brand. You may want a hard side suitcase if you plan to take delicate items. Have a good trip! Hi there. Thanks for the excellent post! I’m traveling to China soon and staying for 2 weeks. What luggage would you recommend? I can’t decide between nylon or polycarbon. Thx! I need the size capability of a suitcase for a Paris trip/France cruise but need something that I can handle on the train from Paris to Lyon. Last year I had a horrible time with my suitcase and carry-on bag during the train portion of my journey. What type and dimensions of suitcase I should prefer, when I am going for Vietnam? And please suggest me, what extra care I should take while traveling to Vietnam? Thanks for asking! You should be fine with either a rolling bag or backpack in Vietnam, unfortunately there isn’t great public transportation so to get around you typically take taxis so rolling bags aren’t really an inconvenience. Within Vietnam the budget airlines dimensions for carry-ons are: 36cm x 56cm x 26cm so stick within that for a carry-on and you shouldn’t have a problem! Here is a Vietnam specific packing list: https://travelfashiongirl.com/what-to-wear-in-vietnam/ Enjoy your trip! When I travel light for a week, I’ll pack my ROLO bag that hangs as soon as I reach my hotel room. Nothing is unpacked until I need it. I pack minimally, so I carry my mini hygiene kit and other essentials in my Rough & Tumble Messenger. Great tips! Thanks for reading and contributing! Happy travels! Thanks for the list. Very in depth and useful information. I wish I didn’t have the misfortune of bringing home a nasty little unwelcome passenger from my last trip. Did you consider bed bugs prevention as a luggage factor to consider? I can think of nothing else having had a taste for the discomfort they can cause. I went with luggage that actually kills them: http://thermalstrike.com/products/Mw== and was hoping to find more info out there. I guess if I had never had them run amuck in my house I wouldn’t be worrying either. Thanks again and good luck on bug-free travels everybody! Nice tips thanks! How do u compare delsey with rockland luggage? Hi Tommy, I don’t own a Rockland suitcase, only Delsey. From what I’ve seen in the stores I would say Delsey appears to be better quality. However, without testing it out first I can’t say 100% for sure. Hi, your list is nicely put together, thanks! Do you know or have views on Tripp suitcases? I have to add my two cents in defense of spinner suitcases. Another advantage of a rollable spinner with 4 wheels vs. a regular pullable suitcase with 2 wheels is that in a narrow space, such as on an airplane or a train car, you can roll the spinner sideways. I remember getting stuck once on a train in Russia where my regular 2-wheel suitcase simply did not fit in the narrow isle. I was literally stuck not being able to lift and carry that thing down the isle to my seat, until some kind soul with much bigger muscles offered to help. As soon as I got back home from that trip I replaced both my check-in and carry-on suitcases with spinner versions and have been very happy since with how they’ve performed even on the exhausting cobblestones in Italy. I am going to Paris for a month in the early spring of 2016. I would love not having to check bags. Is there a carry-on that would work for that length of stay? Any tips for packing light? Nice recommendations I like the Briggs & Riley BRX Duffle in the picture I guess I’m gonna try something like that style. It’s definitely a great brand! I’m more a backpack person than a luggage traveler, but I will pass these tips on to my mom :).